There are 3 main patterns of malignant change that occur in pleomorphic adenoma. Metastasizing pleomorphic adenoma is 1 of these; the other 2 are carcinoma ex pleomorphic adenoma and true malignant mixed tumor (carcinosarcoma). Metastasizing pleomorphic adenoma (the term currently preferred by the World Health Organization [WHO]) is also known as metastasizing benign pleomorphic adenoma, metastasizing benign mixed tumor, and metastasizing mixed tumor. By definition, metastasizing pleomorphic adenoma is characterized by the presence of 1 or more foci of metastatic, histologically benign pleomorphic adenoma. The stage of the tumor is variable, depending on the site of metastasis and the extent of the metastatic foci. Typically, pleomorphic adenoma of major or minor salivary gland origin is present at the time of diagnosis, or the patient has a history of such adenoma, which may be recurrent. Wermuth et al  suggested that pulmonary metastasis of pleomorphic adenoma could arise from aspiration of tumor cells shed from salivary glands into the pharynx. Metastasis occurs primarily to bone (45%), followed by the head and neck (43%) and the lungs (36%). [1, 2, 14] Other sites of metastasis include the skin, the liver,  the retroperitoneum, the kidney, [16, 17] lymph nodes, and the central nervous system. Most patients present with symptoms and signs related to the area of the metastasis. However, some lesions may be asymptomatic; such lesions are sometimes discovered incidentally during a workup. Metastasis may be solitary, or multiple metastases may be present. The clinical history is essential for differentiating metastasizing pleomorphic adenoma from a primary pleomorphic adenoma that is arising in an unusual site. Both the primary tumor and the metastatic lesion appear well circumscribed. The diagnosis of metastasizing pleomorphic adenoma should fulfill 2 criteria. [6, 18] First, the primary and metastasizing tumors must not show changes indicative of malignancy (ie, anaplasia, necrosis, increased mitosis, and an invasive growth pattern). Second, the primary site must be separate from the metastatic site, and both must show the features of biphasic benign pleomorphic adenoma. Although atypia may occasionally be seen, such atypia should be consonant with the atypia encountered in pleomorphic adenomas in general. 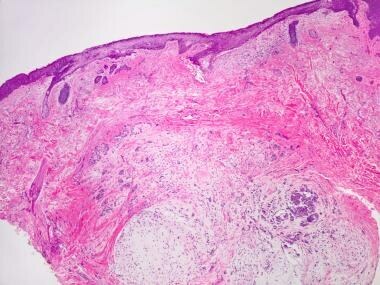 Image shows metastasizing pleomorphic adenoma of skin on lower anterior neck of patient who had previously undergone resection of right parotid pleomorphic adenoma. There was no recurrence at primary site. Neck nodule manifested itself 3 years after resection (unreported case). In an analysis of 3 skeletal metastases from a pleomorphic adenoma, Jin et al found that the karyotypic features of the metastases were different from those of benign pleomorphic adenoma and carcinoma ex pleomorphic adenoma. Their findings suggested that deletions of 1 or more tumor suppressor genes (3p deletions), which are frequently seen in a large variety of malignant epithelial neoplasms, might be important in the progression of some pleomorphic adenomas to metastasis. Takeuchi et al,  in a study of a single case, did not find that the oncogenes and tumor suppressor genes they tested (bcl -2, c-erbB -2, c-myc, L-myc, N-myc, Ha-ras, Ki-ras, RB, p16, and p53) played a role — that is, they observed no rearrangement or overexpression. In addition, immunohistochemical studies did not document any aberrance in the expression of the tumor suppressor gene products RB, p16, and p53 within the tumor. In an extensive flow-cytometric analysis of the tumors and their metastatic counterparts, Wenig et al  failed to uncover any significant predictive findings. Nouraei SA, Ferguson MS, Clarke PM, et al. Metastasizing pleomorphic salivary adenoma. Arch Otolaryngol Head Neck Surg. 2006 Jul. 132(7):788-93. [Medline]. Marioni G, Marino F, Stramare R, Marchese-Ragona R, Staffieri A. Benign metastasizing pleomorphic adenoma of the parotid gland: a clinicopathologic puzzle. Head Neck. 2003 Dec. 25(12):1071-6. [Medline]. el-Naggar A, Batsakis JG, Kessler S. Benign metastatic mixed tumours or unrecognized salivary carcinomas?. J Laryngol Otol. 1988 Sep. 102(9):810-2. [Medline]. Chen I, Tu H. Pleomorphic adenoma of the parotid gland metastasizing to the cervical lymph node. Otolaryngol Head Neck Surg. 2000 Mar. 122(3):455-7. [Medline]. Wenig BM, Hitchcock CL, Ellis GL, Gnepp DR. Metastasizing mixed tumor of salivary glands. A clinicopathologic and flow cytometric analysis. Am J Surg Pathol. 1992 Sep. 16(9):845-58. [Medline]. Goodisson DW, Burr RG, Creedon AJ, Stirling RW, Morgan PR, Odell EW. A case of metastasizing pleomorphic adenoma. Oral Surg Oral Med Oral Pathol Oral Radiol Endod. 1999 Mar. 87(3):341-5. [Medline]. Youngs GR, Scheuer PJ. Histologically benign mixed parotid tumour with hepatic metastasis. J Pathol. 1973 Feb. 109(2):171-2. [Medline]. Girson M, Mendelsohn DB, Burns D, Mickey B. Histologically benign pleomorphic adenoma of the calvaria. AJNR Am J Neuroradiol. 1991 Jan-Feb. 12(1):193-6. [Medline]. Schreibstein JM, Tronic B, Tarlov E, Hybels RL. Benign metastasizing pleomorphic adenoma. Otolaryngol Head Neck Surg. 1995 Apr. 112(4):612-5. [Medline]. Raja V, China C, Masaki KH, Nakano G. Unusual presentations of uncommon tumors: case 1. Benign metastasizing pleomorphic adenoma. J Clin Oncol. 2002 May 1. 20(9):2400-3. [Medline]. Khademi B, Geramizadeh B, Gandomi B, Ghanbarian S. Metastasizing pleomorphic adenoma of the tongue: A case report. Iran J Med Sciv. 2003. 28(3):143-145. Wermuth DJ, Mann CH, Odere F. Metastasizing pleomorphic adenoma arising in the soft palate. Otolaryngol Head Neck Surg. 1988 Nov. 99(5):505-8. [Medline]. Weissferdt A, Langman G. An intracapsular carcinoma ex pleomorphic adenoma with lung metastases composed exclusively of benign elements: histological evidence of a continuum between metastasizing pleomorphic adenoma and carcinoma ex pleomorphic adenoma. Pathol Res Pract. 2010 Jul 15. 206(7):480-3. [Medline]. Sit KY, Chui WH, Wang E, Chiu SW. Multiple pulmonary metastases from benign pleomorphic adenoma. Asian Cardiovasc Thorac Ann. 2008 Jan. 16(1):62-4. [Medline]. Singhal A, Shrago SS, Li SF, Huang Y, Kohli V. A hepatic metastasis from pleomorphic adenoma of salivary gland: an unusual presentation. Hepatogastroenterology. 2010 Mar-Apr. 57(98):330-3. [Medline]. Ebbing J, Blind C, Stein H, Miller K, Loddenkemper C. Metastasizing pleomorphic adenoma presenting as an asymptomatic kidney tumor twenty-nine years after parotidectomy - urological viewpoint and overview of the literature to date. Rare Tumors. 2009 Dec 28. 1(2):e54. [Medline]. [Full Text]. Vivian MA, Sahni VA, Lowe AC, Silverman SG. Benign metastasizing pleomorphic adenoma presenting as a solitary kidney mass: imaging features. Urology. 2012 Aug. 80(2):e17-8. [Medline]. Steele NP, Wenig BM, Sessions RB. A case of pleomorphic adenoma of the parotid gland metastasizing to a mediastinal lymph node. Am J Otolaryngol. 2007 Mar-Apr. 28(2):130-3. [Medline]. van der Schroeff MP, de Ru JA, Slootweg PJ. Case-report: metastasizing pleomorphic adenoma of the parotid gland. B-ENT. 2007. 3(1):21-5. [Medline]. Santaliz-Ruiz LE, Morales G, Santini H, Sánchez-Santiago M, Arroyo A. Metastasizing pleomorphic adenoma: a fascinating enigma. Case Rep Med. 2012. 2012:148103. [Medline]. [Full Text]. Jin Y, Jin C, Arheden K, et al. Unbalanced chromosomal rearrangements in a metastasizing salivary gland tumor with benign histology. Cancer Genet Cytogenet. 1998 Apr 1. 102(1):59-64. [Medline]. Takeuchi E, Shimizu E, Sano N, Yamaguchi T, Yanagawa H, Sone S. A case of pleomorphic adenoma of the lung with multiple distant metastases--observations on its oncogene and tumor suppressor gene expression. Anticancer Res. 1998 May-Jun. 18(3B):2015 -20. [Medline]. Sampson BA, Jarcho JA, Winters GL. Metastasizing mixed tumor of the parotid gland: a rare tumor with unusually rapid progression in a cardiac transplant recipient. Mod Pathol. 1998 Nov. 11(11):1142-5. [Medline]. Klijanienko J, El-Naggar AK, Servois V, Rodriguez J, Validire P, Vielh P. Clinically aggressive metastasizing pleomorphic adenoma: report of two cases. Head Neck. 1997 Oct. 19(7):629-33. [Medline]. Gnepp DR. Salivary and lacrimal glands. Gnepp DR. Surgical pathology of the head and neck. Philadelphia: Saunders WB; 2001. 408-429. Manucha V, Ioffe OB. Metastasizing pleomorphic adenoma of the salivary gland. Arch Pathol Lab Med. 2008 Sep. 132(9):1445-7. [Medline]. Hoorweg JJ, Hilgers FJ, Keus RB, Zoetmulder FA, Loftus BM. Metastasizing pleomorphic adenoma: a report of three cases. Eur J Surg Oncol. 1998 Oct. 24(5):452-5. [Medline].